Gulmarg, meadow of flowers as it literally means, is a beautiful hill station in the district of Baramula of Indian state of Jammu & Kashmir. Earlier known as Gaurimarg, Gulmarg is located at the altitude of 2730m and has pleasant weather throughout the year. Having blessed with the beautiful nature, Gulmarg is one of the most popular tourist places in India. Flowering gardens, beautiful landscapes, stunning peaks in the Himalayan range, serene lakes make the town a must visit place. The scenic Gulmarg offers its tourists many places of attractions. Alpather Lake is one of most preferred picnic spots of the tourists. The lake is located on the valley down the twins Afarwat Peaks of altitude of about 4500 m. This lake is very calm and attractive and remains frozen during the winter. During the summer fascinating views of stream of clear water bubbling through the lake with floating ice pieces can be witnessed. Built 150 years ago by British St. Mary’s Church is religiously important place. It is surrounded by many old huts and hotels and offers tourists the right place to watch snow falling on the surroundings. Alpine trees around the church add to the beauty of the surroundings. A temple, Mosque and a Gurudwara are also situated nearby the church. Built in 1480 the shrine of Baba Reshi is situated in the valley of Gulmarg. Baba Reshi was Muslim scholar and saint who worked as courtier during the period of King of Kashmir Zain-ul-Abidin. The shrine is constructed in Mughal and Persian style of architecture. This sacred place is very revered and thousands of devotees visit the place throughout the year. One of the most wonderful attractions of Gulmarg is the Cable Car. The cable car is from Gulmarg to Kongdoor and known as Gondala Lift. The cable car is managed by Jammu and Kashmir State Cable Car Corporation. The cable car gives wonderful experience of watching the pristine beauty of Valley. Skiing and snowboarding are some of the joyful activities in the Gulmarg. It has become a popular spot for skiing and snowboarding in India. There are many ski resorts with all facilities of skiing in Gulmarg. Golf is the attractive and popular sport in Gulmarg. Established in 1911 by the British, Gulmarg Golf Club offers 18 holes and 72 par golf courses. The club also offers membership on temporary basis, even for a day for enthusiasts. March to June is the ideal time to visit Gulmarg as the climate is pleasant where as the temperature during this month is 29 degree Celsius max. to 13 degree Celsius. Gulmarg is well connected by road to other parts of the state and the country. Many state run buses and private luxury buses are available from other cities of the state and the country. 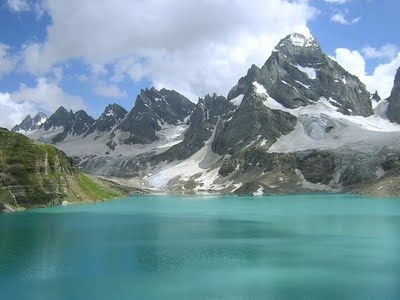 Nearest airport is Srinagar which is 56 km away from Gulmarg. Srinagar airport is connected by regular flights to Delhi and other major cities of the country. Closest railway station to Gulmarg is Jammu railway station. Jammu is well connected by rail to many other cities of India. Kashmiri Shawls, Kashmiri Carpets and Tibetan Handicrafts are some of the most preferred items of shopping in Gulmarg. All major festivals of India are celebrated in Gulmarg. Besides those festivals Gulmarg Snow Festival is organized every year in the month of February. The festival attracts many tourists from all over the country.